Finian Road Image & Design • The Blog: The 2009 Shoot to Fight Cancer is LIVE! The 2009 Shoot to Fight Cancer is LIVE! During the month of April, you can buy a chance to win a photo shoot from Finian Road! There are 125 tickets available, for $25 each. 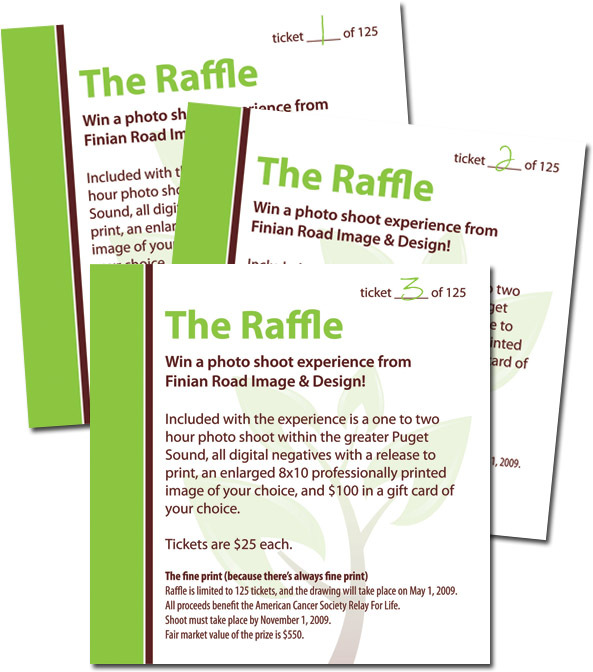 You have a good chance of winning a photo shoot with Finian Road (valued at $425) for you and your family. This year, we are adding a little bonus to the mix! The lucky winner will also receive a $100 gift certificate -- to the place of your choosing! Does Mom want a new outfit for the shoot? Choose your gift card from Nordstrom or J. Crew! Do you want your little ones to be dolled up? Choose your gift card from Gymboree or Old Navy! Does your husband need a little enticing to get him to the shoot? Choose a gift card from The Ram or Cabela's to persuade him. Wherever you'd like -- your choice! Tickets are only available in the month of April - or as long as they last. A number of tickets have been pre-reserved by those who read the blog, so don't miss your chance to make a donation to the American Cancer Society and take a chance to win a photo shoot! We will receive a notice that your donation has been made and your ticket stub will be in the mail to you within 48 hours. It will go to the billing address for the credit card used to pay for the ticket.